Slow cook a roast to maximize tenderness and flavor. This is an effective method for cooking tougher, less expensive cuts of roast or lean, healthier roasts. Heavily marbled roasts become fall-apart tender when slow-cooked in the oven. Oven roasting the beef is a straightforward process requiring few ingredients and kitchen utensils. While the roast is slow-cooking in the oven, your time is freed up to prepare the remainder of the meal. Combine your favorite seasonings in a small bowl and mix thoroughly. Rub the seasoning mixture on the outside surface of the roast. Massage it thoroughly into the beef. Place the excess mixture into a large resealable bag along with the roast. Seal the bag closed and place it into the refrigerator for 2 to 4 hours. Leave it in the refrigerator overnight for best results. 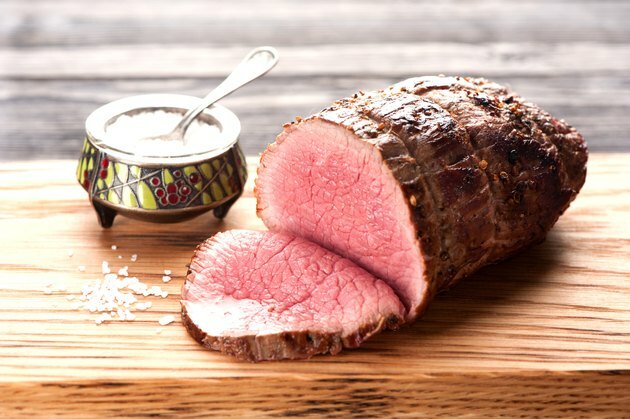 Remove the roast from the refrigerator, set it in a large pot or roaster pan and slide it into an oven preheated to 375 degrees F. Cook the roast until the internal temperature, as measured by a stem thermometer, reaches 145 F for medium-rare, 160 F for medium and 175 F for well done. Take the roast from the oven and allow it to rest on the counter for 20 minutes before serving. The rest gives the juices time to circulate throughout the roast. Rub all surfaces of the roast liberally with coarse grain salt and fresh ground black pepper. Add additional seasonings, if desired, such as thyme, rosemary or red chili pepper. Brush a large skillet liberally with olive oil and heat it on a stove top burner on medium-high. The skillet is hot enough when a drop of water dripped into it dances and pops. Place the roast into the skillet and sear it heavily on all sides, until it develops a brown crust on all surfaces. Remove the roast from the skillet and place it in a roasting pan with the fat side up. Fill the roasting pan with 2 inches of red wine, beef broth or water. Do not pour the liquid directly onto the roast so you don’t wash off the seasonings. Place the uncovered roasting pan into an oven preheated to 250 F. Cook until the internal temperature reaches at least 130 F for medium doneness. Remove the roast from the oven and let it rest for 20 to 30 minutes before serving to allow the natural juices time to circulate throughout the roast. Combine your favorite seasonings such as salt, dried thyme, rosemary, oregano, black pepper or garlic powder in a small bowl. Place the roast in a large roasting pan and rub all surfaces thoroughly with the seasoning mixture. Sprinkle the unused seasoning mix over the roast and cover the pan with plastic wrap. Allow it to set for at least 2 hours. Remove the plastic wrap and slide the roast into an oven preheated to 250 degrees F.
Cook the roast for approximately 30 minutes then reduce the temperature to 200 F. Continue cooking until the internal temperature, as measured by a stem thermometer, reaches at least 145 F.
Take the roast from the oven and let it rest for 30 minutes to allow the natural juices time to flow back throughout the meat. Mix olive oil with the seasonings to create a paste and rub it onto the surface of the roast. The paste will adhere to the roast and create tasty crust. Use olive oil, peanut oil or other high temperature oils.